Support the Latest Version of iTunes 12.9 and Windows 10. Fix the issue of displaying “Loading iTunes, please wait …” when iTunes fails to be launched. Update Japanese, German, and French language packages. Optimize the startup and conversion speed. Fix few bugs on Windows 10. Support more popular output devices including iPhone X, iPhone 8/8 Plus, Samsung Galaxy Note 8 and Samsung Galaxy S9. Add "Add Files" button to add downloaded iTunes M4V file from local folder. Fix the issue that the program fails to find iTunes rentals. Update English and Portuguese language packages, support Hebrew. Support keeping subtitles and AC3 audio tracks under non-lossless format. Fix the bug that some Japanese subtitles can’t be retained. Support keeping subtitles and multiple audio tracks under common MP4 and MOV format. Add output to “Lossless MOV”, “Lossless M4V” format and “TV Console” profile. Add the prompt when it is expected to take more than 3 hours to output video as lossless format. Support popular output devices, Samsung Galaxy S8 and Sony PS4. Fix the occasional crash issue when registering. Show iCloud movie in the Add window. Fix the bug that the program failed to list some movie in iTunes library. Fix the bug that the program did not detect iTunes library successfully on some computers. Support more popular output devices such as iPhone 7, iPhone 7 Plus. 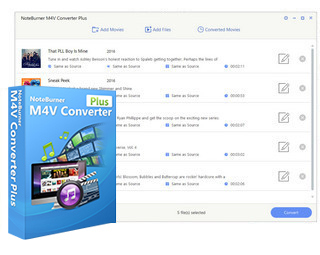 Add search functionality to quick select iTunes M4V video for conversion. Add option to select all audio tracks. Support retaining AD audio track. Support more popular output devices such as Apple TV 4, Samsung Galaxy S6, Samsung Galaxy S7, iPhone 6S, iPhone 6S plus, iPhone 5S, iPhone SE. Fix the out of sync problem on some iTunes videos after converted. Fix the bug that the program can't work well with iTunes 12.2 in some circumstance. Fix the bug that the registration info can't be saved automatically since last update. Fix the problem that iTunes can't be launched normally in some circumstance. Fix the sudden iTunes crash problem while converting on Windows 8 64-bit. Fix the iTunes crash problem when converting some specific iTunes videos. Compatible with the latest iTunes version 12.1.x (32-bit & 64-bit). Fix the converted video resolution problem if customizing size option as auto. Fix the problem that same as source conversion does not always keep the original resolution. Support more popular output devices such as iPhone 6, iPhone 6 plus, Samsung Galaxy S5, Google Nexus series.
. Change to a brand-new interface. Support converting to multiple video and audio output formats. Add clip feature to customize the video length for conversion. Add customization options for adjusting the video/audio parameters.